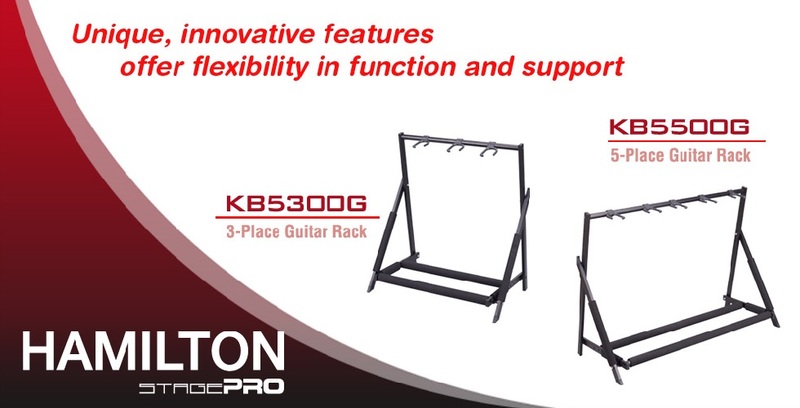 Hamilton Stands introduced two new guitar racks at the Summer NAMM Show in Nashville this last July. The racks are designed to be extremely versatile and portable while securely and gently cradling the instruments. A 3-place rack at 23 inches wide and a 5-place rack at 37 inches wide have two padded rails at the bottom to cushion the instrument bodies and a single rail across the top with 3 or 5 rubber "hands" that act as neck rests. These hands may be moved to accommodate instruments of varying body depths. The steel racks fold up quickly and easily for transport and storage. All points of contact with the resting instruments are covered in finish-safe rubber composites and the side rails are also covered in the same padded material to prevent dings or scratches from aggressive instrument exchanges. The steel is finished in "stage-friendly" black. What really makes these stands unique is the adjustability. The cradle rails can be narrowed and the neck rest rail can be lowered to accommodate smaller instruments like mandolins and even soprano ukuleles.